You cannot visit the many theme parks in Orlando without experiencing the water rides at least once – after all, on a boiling hot summer’s day there is nothing more refreshing than getting a soaking, or so my children would have me believe. Personally, I would rather sit with a nice cool drink, but luckily I am in the minority! Millions of visitors to Universal queue for hours just to get completely drenched, so it must have huge appeal. For those of a nervous disposition here is a brief guide to what you can expect if you are tempted to try the water rides. Whilst I usually give the water rides a miss, my children are first in the queue, and I have many a photo of them plunging headfirst down a steep slope – well, actually I have to admit I usually miss them and end up with photos of complete strangers, as I really have no idea who I am photographing because you have to be SO quick! Popeye and Bluto’s Bilge Rat Barges can be found in Toon Lagoon at Islands of Adventure. There is definitely water, water everywhere and the ride is surprisingly steep. You sit in a round raft which accommodates 12, and has a height requirement of 42 inches. Will you get wet? Definitely! So expect a good soaking, especially from overhead. 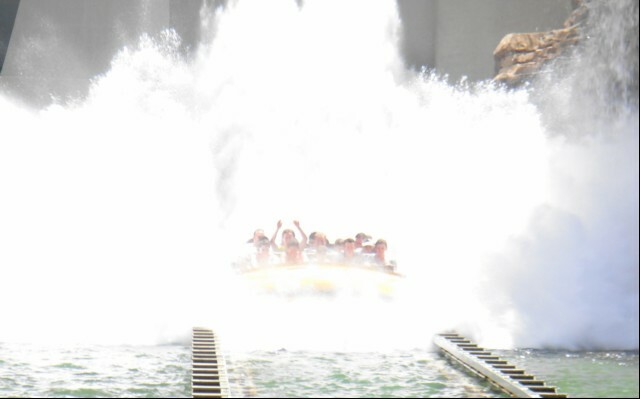 One of my children’s favourite water rides is Jurassic Park River Adventure, another one which I declined, but was at the ready with the camera. It is a themed water ride, with of course, a dinosaur theme. With its soundtrack and strategically placed prehistoric dinosaurs you are unprepared for the final giant splashdown. Seated in a boat with 5 rows of 5 seats and a pull down bar you will have to be at least 32 inches high to enjoy this thrilling ride. Whether or not you get soaked depends on where you sit, and how heavy the occupants are – the heavier the load the bigger the waves generated. You may be lucky and just get a little damp, or you could get soaked. Spectators also have to watch out as they, too, can get a little wet. Don’t miss this one! Islands of Adventure also offers another themed water ride – Dudley Do-Right’s Ripsaw Falls at Toon Lagoon in Islands of Adventure. Here you will find a cartoon setting with classic characters, sound effects and a log-flume vessel which seats five in single file with lap bars. You must be 44 inches to enjoy this watery experience, and it is a bit of a tight fit for those who are tall and perhaps not so sylph-like. There are several minor drops culminating in a dramatic splashdown which really is very steep. Water tends to come over the sides and into your lap, but you might be lucky and escape a soaking. However, don’t be too smug, as onlookers can pay 25 cents to fire a water cannon at you at the end! The final water ride I can recommend is Journey to Atlantis at Seaworld. You sit in a boat with four rows of two seats, and a single lap bar. There is a height requirement of 42 inches so not one for the youngest members of the family. The final splashdown looks quite scary but you won’t get totally soaked. I have to admit that I have not actually experienced this ride myself, as I am much too much of a wimp. But I have stood and watched my children as they scream their way round this ride. So if you are visiting Orlando, then take the plunge, and join the thousands of happy people who enjoy getting wet. Water is wetter on Jurassic Park!